Hold onto your shirts! The Dad Jam family has grown! 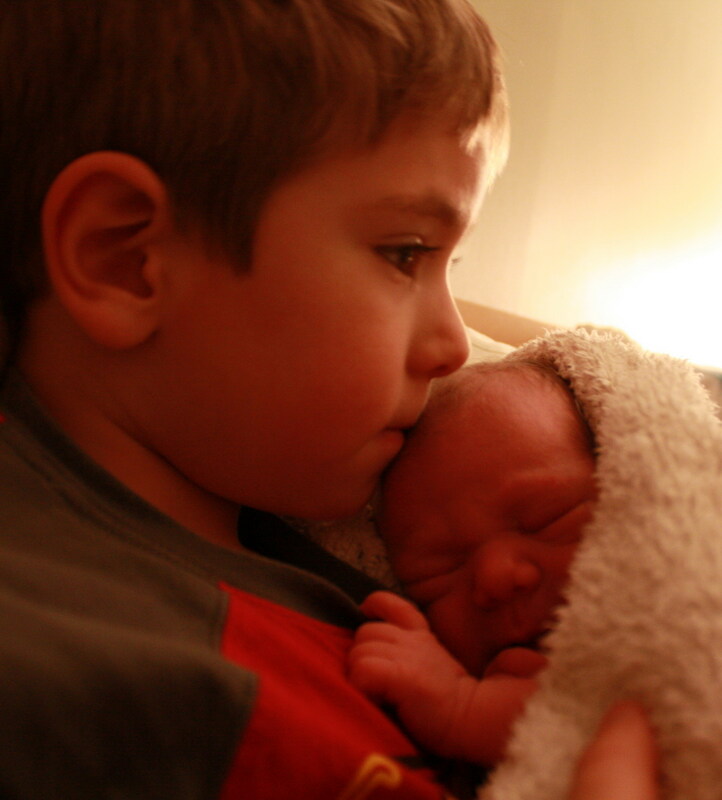 We recently welcomed our son, who I’ll call Smarty Pants 2, to the world, making us a family of five. Three kids!! (by the way, I am calling him Smarty Pants 2 for two reasons: 1) I can’t think of a better name right now, and 2) he looks a heck of a lot like Smarty Pants did when he was born. Smarty Pants 2 is a little over two weeks old now, and somehow we managed to survive our first two weeks with three kids… mostly thanks to the awesomeness and strength of my lovely wife, Love Buns. 1) Don’t let anyone into your house in the first week unless they are carrying bags of food (preferably food that you can freeze) – this may sound a bit selfish, or odd… but it is true. Your first week with three kids is hectic… you and your spouse are now outnumbered by your kids… and one of them is a teeny tiny baby that needs a tonne of undivided attention from at least one of you pretty much 24/7. Having visitors during the first week can add to the commotion, since your baby is not on a schedule yet, and you haven’t fully adjusted to having another child in your household. But, if said visitors bring some food with them when they come to visit, it is a big plus. Finding time to cook meals will be difficult, so any pre-made meals you get will be huge time savers. Especially if you can freeze some of them for later in the week when you’re really in a pinch. I must say, we have awesome friends, and everyone who came to visit us was kind enough to bring some food with them when they visited. We didn’t ask for it, they were just thoughtful and wanted to help us out, and we gladly accepted the help. It really made a huge difference and we are very grateful. Of course, try to reciprocate as much as you can…you don’t want to take take take without giving anything back, so have some play date exchanges, give thank-you gifts, etc. In essence, build a community with other parents to the best extent possible. 3) Rest and enjoy as much as you can – luckily the baby will sleep quite a lot in the first couple of weeks. Take advantage of this time to try and rest as much as you can. If you followed steps 1 and 2 above, you should have saved some time in your day for resting. If you’re a working dad, hopefully you’ll take at least a week off of work too, and use the time to help your wife and also get some rest yourself. And of course, enjoy this time with your precious new little baby. Unless you are prepared to have four or more kids (i.e. you are really brave or really crazy), this will be your last little baby. So enjoy the time, and it will make it go that much smoother. Leave a comment and let us know what you think of these tips, and if you have any other tips to share! Cheers and all the best! My wife and I are expecting our third in March and are nervous as to how we will handle it. These tips are great and helps us to prepare for the upcoming child. Thanks and keep the advice coming. Congratulations Colin! Glad you enjoyed the tips. I’ll post more in the coming weeks as well! It is going okay so far! Best of luck to you! Recommend soft music, massage and hugs for parents as much as possible. Romance, TLC and hot tea to R E L A X. Try not to obsess over little changes. It’s ALL gonna change…for the better. Congratulations Colin and Head Hammer! Oh congrats to you guys, what an amazing holiday gift. He’s beautiful and wow are you guys brave. I know once the boys out-numbered us we had to come up with a game plan. Like warriors on the battle field we drew maps and everything lol. Hi Jodi! Thank you! lol… I like your comment… too funny… I can see the need for it! Thank you for your comment Rebecca! Your third came just a bit before ours. I think it is just the initial intensity of having a newborn and the change to suddenly having three children. It is a lot of work at this stage, I hear ya, we are going through it too. But it will get better and easier for sure. The first year is always the hardest I find. Do what you can to find help where you can for some relief. If you survived the first two, you will survive this third one for sure! and everything – like the clock, a picture. . One thing though is that he doesn’t sleep well. any advice on that is appreciated. Hi Danielle! I have written some “jams” here about sleeping – check out the archives or do a search and hopefully you’ll find something that helps you. If not, let me know and I will write some more! Cheers. Building a village.. I like most..
and likewise a nice way of sharing burdens in times like this..
Who knows who will be needing help the next time around.. I loved the part about not letting people in if they don’t bring some food. It can be quite hectic, and who has time to cook any good nutritious meals. One thing I can suggest is to make some meals and soups ahead and freeze them. I also do some canning and those things come in real handy for a quick meal. Thanks for your comment Jeannie! And freezing meals and soups ahead of time is a great tip, thanks for sharing!